Puzzle games, the kind where each player tries to solve a puzzle and the fastest one wins, rarely become popular with gamers. It’s easy to see why, too: there’s no interaction, no planning ahead, just silent competition about who finished first. That can be fun for a bit, but it loses appeal quickly. To make a puzzle game you can bring to your gaming group and they actually ask you to play again needs a special twist. That’s why La Boca had been lying around still in its shrink wrap for the best part of a year, we were all a bit skeptical about it. What made us open and try it in the end was the simple fact that it’s a game by Inka and Markus Brand, designers of Village, Murano and a long list of other games. They are not known for boring ones. 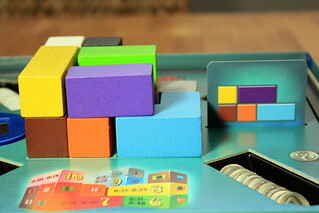 La Boca is a puzzle game of the wooden block persuasion, named after Buenos Aires’s beautiful La Boca neighborhood that the puzzles’ results resemble. Ten wooden blocks, or eleven for the more difficult puzzles, have to be arranged to match a picture shown on a card. The blocks are simple shapes: simple cubes, cuboids made of two or three such cubes and two blocks with a right angle, and all in different colors. They have to be arranged in two or three levels, the side view of the final result has to match the card. 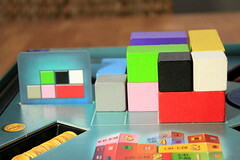 Additionally, no block may go beyond the 4×4 squares of the game board, there may be no holes under a block and all tiles have to be used, even if they are not visible on the card. That’s all pretty standard so far, so where’s the twist? 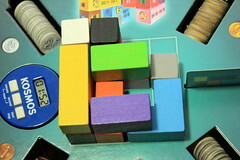 Unlike most puzzle games, players are not solving La Boca‘s puzzles by themselves. Changing teams of two players – every pairing comes up twice during a game – have to solve their puzzle together. Each of them sees one side of the card and they must arrange the blocks so that the facades facing them match their side of the card, without ever seeing the other’s side, just by talking and planning what block goes where. That’s how you get interaction into your puzzle games, if you want to succeed in La Boca you have to talk to each other. Granted that conversation often goes “I can’t see red” – “I can’t see red, either” – “Don’t put that there, I need blue there” – “This is impossible!” – “Oh, THAT’s how it fits”, but yelling that at each other is so much more fun than silently puzzling on your own. To keep score, we’re still coming back to who does it fastest. After all, what else are you going to do in a puzzle game? For the best score, 10 points for a puzzle, you have to complete it in 15 seconds or less, not an easy task at all. Take longer than two minutes and you score nothing, but that’s rare even with the harder puzzles. Now, make no mistake, La Boca is still very much a puzzle game. There is no strategy, no planning ahead, no confrontation with your opponents, just the race against the clock. Neither is there, and I regret that more, a third level of difficulty. After two or three games, the harder puzzles are not a big challenge any more. It’s not that you remember the solutions, many cards are too similar for that, but you learn the tricks like how to hide that damn red block in the middle of everything else, and that makes your life a lot easier. At that point, it would be nice to have another bit to add. For some players, downtime my also be a problem. While you’re not playing, you have nothing to do, and while most puzzles are solved in thirty seconds or less you may sometimes have to wait a few minutes before it’s your turn again. Worse still, you’ll have to wait without telling the active players what to do, even when it’s completely obvious to you where that block goes they cannot fit in. You can probably tell that the last part was quite hard for me. 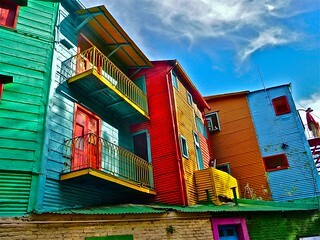 But despite those problems, La Boca is a very enjoyable game. Not something to play all the time, but great for the occasional bout of wildly yelling at one another.